Long-term care homes in Ontario are for people with significant health challenges and cognitive impairment who need access to nursing care and supervision 24-hours a day. Long-term care homes are also called nursing homes, and should not be confused with the term ‘retirement home’. In Ontario, all long-term care homes are publicly funded and regulated by the Ontario provincial government. Ownership can vary, with 57% of long-term care homes privately owned, 24% owned by non-profit/charitable, and 17% municipal. Operators are mandated to follow the provincial government’s requirements for running a long-term care home, as prescribed by the Long Term Care Homes Act, 2007. 1. Who gets accepted to long-term care homes in Ontario? Admission criteria for long-term care requires new residents to have high or very high physical and cognitive challenges to qualify. Needing very high needs to qualify, people now come to long-term care at a later stage in the progression of their diseases, when their health issues are more complex, and they are more physically frail. In these later stages of poor health, family or caregivers are no longer able to provide the necessary support at home or in a retirement home. Although more than half of long-term care residents are over the age of 85, long-term care homes also provide care to younger adults who have experienced brain injury, stroke, and other conditions that require 24/7 care. Almost all need some level of assistance with activities such as personal hygiene, dressing, and eating. One in every three residents is highly or completely dependent on staff. 2. What are the caregiver-to-resident ratios in long-term care homes in Ontario? Although people enter long-term care homes because they need access to nursing care around the clock, residents are largely cared for by personal support workers (PSWs), also called personal care workers or health care aides. 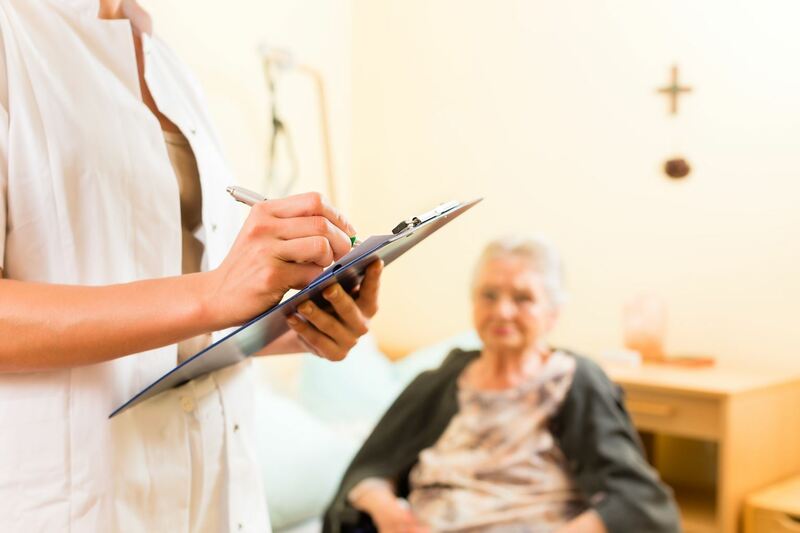 As of 2013, frontline staff at long-term care homes consisted of 9.5% registered nurses (RNs), 18.4% Registered Practical Nurses (RPNs), and 72.1% personal support workers (PSWs)1. During the day, most long-term care facilities have a ratio of one personal support worker to 10 residents. This means that one staff member is responsible for the entire personal care of 10 residents over an 8-hour shift. Personal care needs include changing incontinence briefs, changing bedsheets, showering residents, applying cream to skin, brushing teeth or dentures, dressing residents, combing hair, and putting in hearing aids. During overnight, the ratio of PSW to resident decreases to one personal support worker to 14 residents. If a personal support worker calls in sick, employers sometimes don’t replace them, creating an “unsafe” work environment with even higher ratios2. Staff of long-term care homes have often called out in crisis saying that at times, they are left to care for up to 42 residents, while nurses said they are sometimes responsible for between 30 and 40 residents. The Ontario Council of Hospital Unions says 91% of workers it surveyed feel they can’t provide quality care because they have too many residents to care for3. Due to the low staff to resident ratio in long-term care homes, families of residents can grow concerned about the quality of care and attention their loved one is receiving. Residents’ families and powers of attorney (POAs) often employ private one-on-one caregivers for their loved ones. Private one-on-one caregivers ensure that the personal care of the resident is being looked after in a timely fashion and that the resident is engaged and kept company. Retire-At-Home Services Toronto supplies one-on-one caregivers for your loved one in the hospital or in long-term care. 3. What will other residents be like at long-term care? People accepted into long-term care or nursing homes in Ontario are classified as having very high needs. This means having impairments in multiple areas of function including physical disability, cognitive impairment, falls, and challenging behaviour. 3. How does my loved one get accepted to a long-term care home? Once approved, waitlist times are often long, and will vary for each facility. Average time to placement as of December 2015 was 103 days. Your choice of room will determine your wait. Room choices are ‘Basic’ which accommodates 2 residents with an attached washroom, ‘semi-private’ which is occupied by one person with an attached washroom shared by the resident in the adjacent semi-private room, and ‘private’ which accommodates one resident and has an attached washroom which is not shared. For some of the most attractive nursing homes like Belmont House or the Baycrest Apotex in Toronto, waitlists can be up to 3 to 4 years. Usually waitlists for private rooms are longer than for semi-private. To give an idea of wait times for a nursing home with less demand, we can look at the Downsview Long Term Care Centre in North York. It has 252 licensed beds, and as of May 2017 it had 82 people on the waitlist for a basic room, 2 people on the waitlist for a semi-private room, and 7 people on the waitlist for a private room. An average of 7 beds come open every month, meaning that there is a good chance a waitlisted candidate will be accepted within a year. Villa Leonardo Gambin nursing home in Woodbridge on the other hand has 168 licensed beds with a whopping 627 people on the waitlist for a basic room, no semi-private rooms offered, and 497 people on the waitlist for a private room. An average of 3 beds free up per month5. If your family finds itself in an urgent situation where a loved one ‘needs care now’ all is not lost, there are priority categories that can get a candidate placed even within a week. During the CCAC assessment, your loved one will be placed into one of four priority categories. Each priority category also affects wait time. Category 1 People who need immediate admission to long-term care and cannot have their needs met at home, or who are in hospital and cannot be discharged home. People in a long-term care home that is closing within 12 weeks. This is the highest priority category, and people who get assigned this category maybe someone who had a caregiving-spouse die, or someone who have had a severe change in their mobility or cognition and who have no one to look after them. Category 2 People who need to be reunified with their spouses/partners who are currently residing in a long-term care home, and who meet eligibility requirements (including care needs). Category 3A People waiting for a long-term care home serving those of a particular religion, ethnic origin or culture. People who can still be supported at home, regardless of their high care needs, until a bed becomes available. People in hospital waiting for a long-term care facility. People in long-term care seeking transfer to their home of choice. Category 3B People waiting for a long-term care home serving those of a particular religion, ethnic origin or culture. People who can still manage at home until a bed becomes available, regardless of their high care needs. Wait times for clients in this category are much longer. Category 4A People who can still manage at home with supports until a bed becomes available, regardless of their high care needs. People in hospital waiting for a long-term care facility. People in a long-term care facility seeking transfer to their home of choice. Category 4B People who can still manage at home with supports until a bed becomes available, regardless of their high care needs. Wait times for people in this category are much longer. Veteran People who can still manage at home with supports until a bed becomes available, regardless of their high care needs. Wait times for clients in this category are much longer5. What happens when you are accepted to long-term care? When acceptance occurs, it is very quick and hurried. You will receive a call from the CCAC with an offer of a bed in one of the homes you listed during the assessment. You will have 48 or 72 hours to accept the bed and move in, or else risk moving to the end of the waitlist. If your loved one is not yet ready to go, then waiting is not a serious situation – sometimes an offer can come up sooner than you expect and it takes you by surprise! If your loved one is really uncomfortable about accepting an offer so soon, you may be consoled to know that if an emergency or crisis occurred in your family’s situation, there is a small safety net – your loved one can be reassessed and may be assigned a high priority category for very quick placement. If you are reassessed and deemed in a ‘crisis situation’ the very next offer of a bed must be accepted. 4. What are the costs of long-term care homes in Ontario? A resident paying a basic accommodation rate (currently $58.99 a day for a shared room with two to four beds) and without a government subsidy would pay roughly $1,794 a month. Residents also pay out of pocket for any medications or other services not covered by their private insurance plans or the provincial drug benefit program. Government subsidies are available for those who can’t afford to pay the full amount, this is sometimes called a ‘rate reduction’. All homes, regardless of their ownership (e.g., non-profit, private, municipal), accept residents whether they are able to pay or not. The subsidy, however, is not available to people requesting semi-private or private rooms, it is only available for Basic room accommodation6.